Archive by category "Press and media mentions"
An article in Italian about the book Digital Leadership. BOOK RELEASE – New guide to London featuring female entrepreneurs – Sofie Sandell is one of them! Covet London is a book celebrating female entrepreneurs and all they have accomplished. These women add diversity to this great City by putting their hearts into their business and giving back to their communities. The Covet Guide connects you with inspiring female entrepreneurs who help shape the culture of this eclectic city. You will be introduced to a diverse range of creative, talented women in business; from innovative fashion designers with the latest styles, to hands on healers that miraculously dissolve your stresses to food experts with delectable delights. These are the people we love to meet, the places and spaces that nourish us, the resources that we covet! 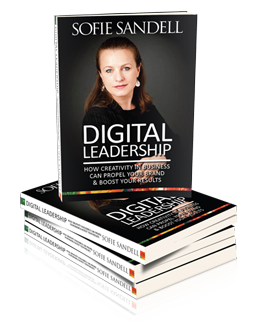 Sofie Sandell is included in the guide giving readers insight about her and the story behind her brand and her book ‘Digital Leadership’. Sofie is pleased to be featured in Covet London, and hopes readers will love finding out more about her and over 100 other inspiring female entrepreneurs. Each entrepreneur has their own varied backgrounds, ambitions and passions and each have developed distinguished businesses that make London unique. Covet London will be available from 45 boutiques across London and online through Amazon as of October 15th. With an exciting launch party at BB Bakery (featured in the book), the event will be an opportunity for all the entrepreneurs featured to meet one another, share their stories and celebrate each other’s accomplishments. A few of the entrepreneurs will be sharing their talents with the group including music by Songbird Sessions, entertainment by Miss Ballooniverse, and hors d’oeuvres from the Cookery School, BB Bakery and On Patisserie. Carlie Parkinson is a female entrepreneur herself. With a Bachelor in Commerce in Entrepreneurial Management, Carlie has always had an interest in starting her own business. In 2006, after a period of living in London, England, Carlie returned to Vancouver, Canada and established Portobello West – a monthly fashion and art market inspired by Spitalfields. In 2009, Carlie and her husband moved to Toronto, Canada to expand Portobello West. While there Carlie took on a project in partnership and created a guide to female entrepreneurs in Toronto with The CRAVE Company. Carlie returned to London in 2012 and decided to start another business. She created Covet Girl Publishing with the primary product being a book featuring London’s female entrepreneurs. Inspired by her experience with CRAVE, Carlie took the model and made it more suitable for London and the UK market. The Covet London Guide was started in August 2012 and has been developed through extensive researching and interviews with a wide range of London’s inspiring female entrepreneurs. What did major brands Kodak, Blockbuster and HMV all have in common? They all denied that digital matters and they didn’t listen to their customers. When their customers changed their behaviour and stopped consuming as they used to, these brands lost a significant part of their businesses and thousands of people lost their jobs. Today, digital and social media skills are essential in any profession. As a brand you must engage with your clients and listen to their needs. 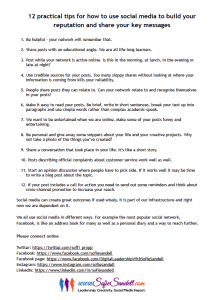 Social media is an excellent communication tool if used in the right way. Use it intelligently and you will be one step ahead. Sofie Sandell, the author of Digital Leadership, is encouraging all leaders and people who want to inspire others to use these tools more effectively. Her new book covers why social media matters, how creativity in business works and explains why you need to get involved in digital development to avoid being left behind. Sofie Sandell is an entrepreneur with interests spanning from technology and leadership to art and sailing. She is a public speaker, trainer and author. Sofie was the first social media manager at a large publishing house in London and has been involved in digital media for over ten years. She has had a number of leadership roles in non-governmental organisations and in 2011 was awarded the Freedom of the City of London in recognition for her services to the city. 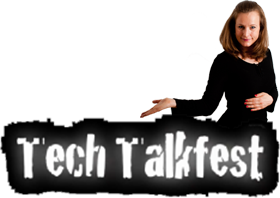 Sofie is also a regular contributor to the technology radio show #TechTalkfest where she talks about all things digital. She wrote this book to be able to share her views with a wider audience. For more information about the book or to purchase a copy, go to www.sofiesandell.com/book or contact publisher@sofiesandell.com. If you would like to invite Sofie Sandell to speak at your event please get in touch. Sofie is also going on a book tour and if you would like to organise an event let Sofie know at hello@sofiesandell.com.